The weather’s getting chilly, so I thought it was about time I made myself a new scarf. 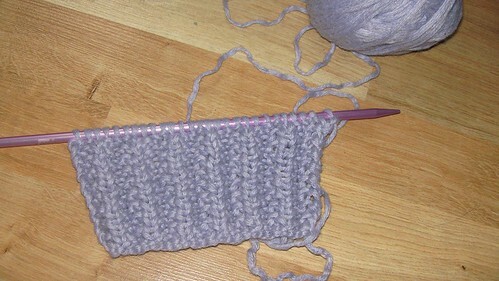 I’m knitting this on US 10.5 needles, out of yarn that I recycled from a thrift store sweater. (Most of my yarn stash has been acquired in this manner.) If I remember correctly, the yarn is a wool/acrylic mix, though I can’t recall in what percentages. Purple is one of my favourite colours, and I think it looks nice in the mistake rib pattern. Perfect for keeping away the cold air, especially when my new job is very close to the harbour’s edge. In the winter, the wind blowing off the ocean can be bitterly cold, and I don’t want to get sick because I was lacking a scarf! I promise I’ll make more posts than I have been. I’ve been busy with work, and recently my friend’s grandmother died, a woman who in some ways was also like a grandmother to me, which has thrown me off balance. It hasn’t been easy, but I’m trying to get back into the swing of things. So I promise there will be more things to come on this blog than just the silence treatment I’ve been giving it this past week or two. I don’t know if anybody has heard of Knit for Japan, a charity which was started by one man trying to improve the lives of the people who were affected by the Tohoku earthquake. He’s accepting donations of knit or crocheted anything, particularly hats, socks, scarves, mittens, blankets, or other clothes. But he also has said that if you have spare yarn or needles that you don’t want anymore, you can send them his way and he will see that even they are donated to people who need them. Imagine if you were affected by a disaster and you lost access to your favourite craft, the thing you would do to relax and to feel productive and good about yourself. Imagine, then, somebody handing you those tools once again. Wouldn’t that make you feel good? Not just by giving you a way to relieve your stress, but also because it shows that somebody cares about more than just your basic needs for survival. Life is more than food and shelter. Life is also all those other little things that go unnoticed during disaster relief, the day to day tasks that make you feel human instead of just another mouth to feed, just another number on a register. Once the basics are out of the way, what then? If you have yarn and needles or hooks to spare, please consider sending them along. The address to send them to is listed on the Knit for Japan website. Or if you want to knit a scarf or a hat or something to help keep people warm this winter, please consider that too. People have been displaced and are relying on government assistance or friend or family, and may not have jobs again yet. A child might walk to school this winter, warmly wrapped in a new handknit wool scarf thanks to you. I have lots of yarn stored up that I have no immediate plans for. I think that the least I can do here is make a few things and send them to people who need them. It might be hard to see much difference between this progress post and the previous one, because I haven’t worked any large sections. I’ve been spending time filling in a lot of the smaller areas, little bits that only need a few stitches of a certain colour, trying to get some of those out of the way, because they’re the parts that I like the least. I like working on larger areas of colour rather than smaller fiddly ones. One area that shows clearly, though, is the tree and the blossoms of the left side of the image. I really like how that looks! Working more and getting distracted by bumbling kittens isn’t doing much to increase my productivity, either. But I still enjoy both of those things a lot, so it isn’t terrible to give up some of my sewing time to play with cats! I haven’t done much work on the blackwork board sampler, but I’ve done enough to feel that showing it won’t bore anyone who recently read my last post about it. 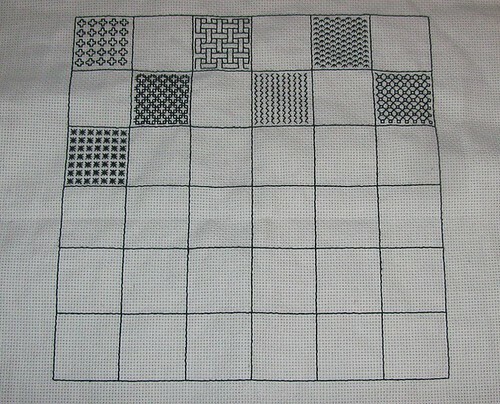 Some stitch patterns I’m getting from other samplers and patterns that I’ve seen online. Others I’m making up as I go. It’s turning out to be quite pretty, and I’m getting a good idea of which patterns are easy, which look easy and yet are complicated, and which look very nice but are a real pain to actually do. The first pattern on the second line looks really nice, but it was so tedious to do even that much of that I got frustrated with it for a while, and then as soon as that square was completed, I immediately decided that the next square would be something very simple and quick. I’m running out of embroidery floss, though. It’s surprising to note that what I have right now has taken up almost an entire skein of black floss, and I’m going to need to buy more soon in order to keep working on it. 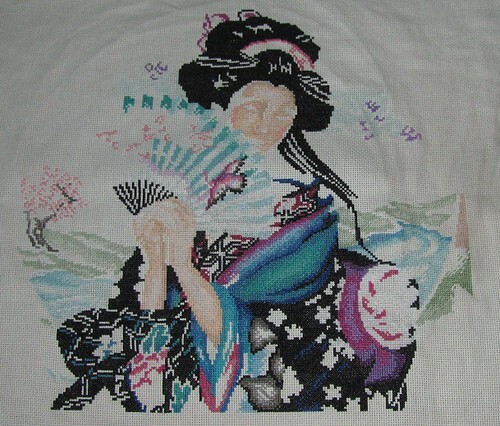 With my Enchanting Geisha cross-stitch, it can be hard to remember just how far a skein can go, because everything’s cut into pre-measured lengths, and I’m changing colours too often to really get a good idea of how much space can be covered by a certain length of thread. And of course, it all depends on the stitch you’re using, too. But in spite of the occasional frustrating pattern, I’m having fun with this project and look forward to working on it more. I ordered this book a couple of weeks ago, and was thrilled when it finally arrived on my doorstep. A nice treat to come home to after work! There are a so many beautiful patterns in this book that I want to try making, from little decorative ornaments to more practical items like bags. Some of the fabrics I got from the yard sale might work perfectly in some projects from this book, especially ones that I don’t plan to use to make a quilt. 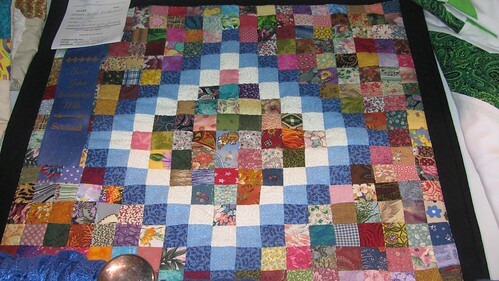 I’m looking forward to getting some sewing practice here, and making some very beautiful things! It also happily goes into some of the history and tradition surrounding gift-giving in Japanese culture, which was nice to read. 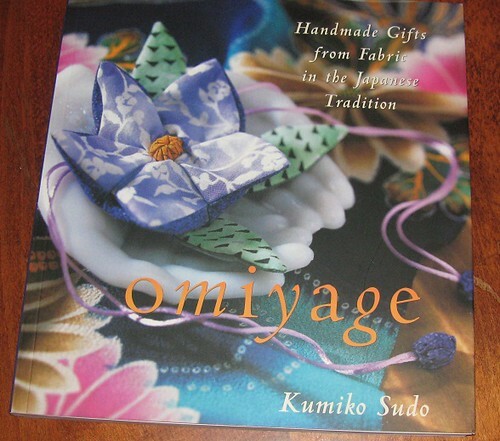 If you’re interested in Japanese gifts, or if you have a lot of fabric scraps and no idea what to do with them all, then take a look at this book if you get the chance. It’s worth it! I wish I could say I’ve made more progress on this than I actually have. I say that a lot about this project, though. I ought to learn to be content with whatever progress I have made instead of just wishing I’d done more. 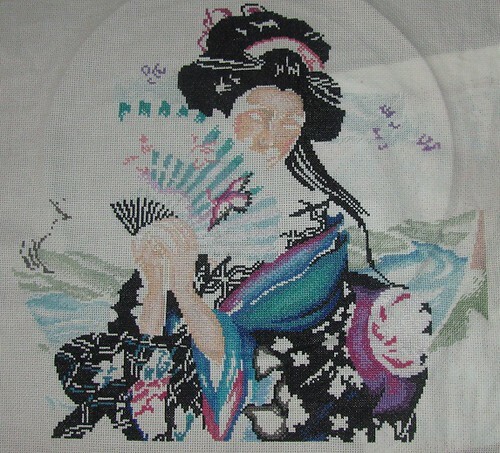 I did do more work on her fan and face, though, with a little more colour in the kimono and a start to the blossoms, which right now just look like purple blobs in the sky. I’m a lot happier with her face now. It’s starting to look a lot more like a face and less like an invisible person wearing a mask. A lot of my time this past week has been spent sleeping, cleaning, and preparing for my new job, which starts today. I’ve been excited about this job for months now, and I’m glad the day has finally come when I can start it! It may leave me with less time for crafting and reading and all the other things I enjoy doing, but it will allow me a greater amount of financial freedom, which is also important. Wish me luck! Much like when I was young, I still enjoy the Atlantic National Exhibition that occurs every year at this time. However, compared to when I was young and went for the rides and games and expensive greasy food, I now go to see the livestock displays, the handcraft competitions, the skill demonstrations. I got a few pictures of some of the excellent handcraft entries this year. It seems that the competition is branching out in terms of what it will recognize and judge. In years past, I’ve seen 2 categories for knitted dishcloths, for example, and the one that invariably takes First Place will be a garter-stitch dishcloth in the exact pattern you can find on the ballband of any ball of dishcloth cotton. Sometimes the one that takes First Place has obvious flaws in it, bad tension or a dropped stitch here and there, while well-constructed items like sweaters with complex lace or cable patterns go unrecognized because too few people would make and submit them for consideration. It bothered me, partly because the hard work and creative talent of so many people were going unrecognized, but also because people were winning prizes for things I could have done while half-distracted by television. But things seem to be better this year. There were more categories, and dishcloths were actually overwhelmed by lace afghans and scarves. I saw some real creativity demonstrated. Sure, I saw some things win prizes when they weren’t particularly impressive, but I think some of them won those prizes because nobody else actually submitted anything to the category, not because the judges have poor taste. Anyway, I didn’t get as many pictures as I wanted, but I did get a few, and I wanted to take a moment to show off some pieces that interested me. 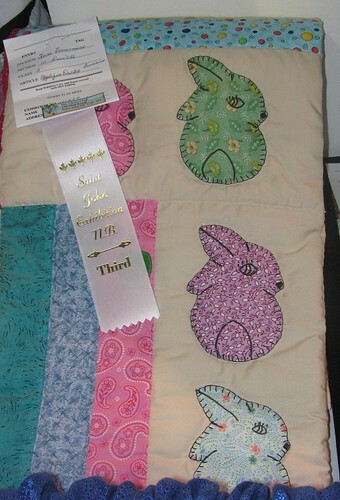 This appliqued bunny quilt was adorable, very cute, and I can honestly say that I don’t think I’ve seen anything like it in years past. Not here, at least. This quilted wall-hanging, done in 1-inch squares, is impressive because sewing that many squares isn’t necessarily easy even if you’re not making a queen-sized quilt! I like the colours and the pattern that the quilter used, and I took the picture because I want to someday make something like this for myself. Endulging in a bit of geekery here, I adore this nyan-cat pillow. 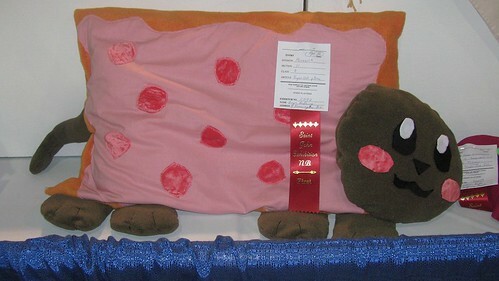 It was even labeled “nyan cat pillow”, which impressed me almost as much as the pillow itself, since it shows that either the judge recognized it or else they didn’t just erase part of the description on the submission form. It’s very cute, and I wish I knew how to get in touch with the person who made it, because I’d love to commission one! Next year I’ll take more pictures of the various handmade things. Next year, I also want to submit something myself. There are a few things I know I could stand a chance of winning a prize with. The homemade jams I enjoy making, one of my cross-stitch projects, perhaps a knitted lace shawl or blanket. I don`t think they have a category for woven things, but I`ve wanted to learn card-weaving for a while, and maybe if I try they might let me submit something like that. I`d best get to work! I live on the east coast of Canada, and I enjoy making things with my hands. Knitting, embroidery, and cooking are what I enjoy most, but I'm not averse to trying new things. Oh yes, and I also dye my own yarn/thread!